How to disable package 3 services in the "Beeline"
The so-called "three Pack service", consisting of a GPRS-Internet, WAP and MMS, the company "Beeline" connects its subscribers by default on all tariffs. But if you accidentally or intentionally turned off data service, you can connect it again any most convenient way for you below. Make sure that "three services Package" on your room is really off. To do this, send from your phone USSD-command *110*09#. In response you will receive SMS-message with the list of all connected services at the time of the request. If the "three services Package" is already connected it will be listed in this list. If in the resulting list, it is not, select the connection method. Connect the "three services Package", sending from your phone USSD-command *110*181#. Wait until the SMS that the service is activated. Phone 0611. If necessary, activate the on-screen keyboard to be able to navigate through the menus. Go to the alphabetical list of services "Beeline". Select the "three Pack service", and connect it by pressing the appropriate key. Or wait for connection with the operator service center. When speaking with the operator be prepared to provide the passport data specified in the contract. Call us on 0674. If required, activate the onscreen keyboard. Connect the "three services Package", in the menu section. To navigate, use the tips of auto. Wait until the SMS that the service is activated. 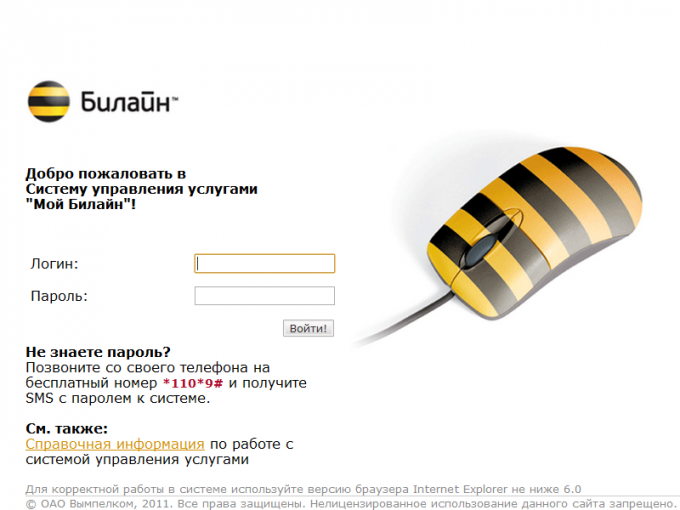 Make use of the Internet control center service "My Beeline" https://uslugi.beeline.ru/. Request a password to log into the system using the USSD command *110*9#. Also request the web password for the service *111# and in the SIM menu. Login and password will come in reply SMS. Enter the received password in the designated field on the login page of the system. When entering the password, be careful. If you get it wrong 10 times in a row, entrance to personal Cabinet will be locked at night. To restore a permit before you will be able only through the operator's customer service Center by phone 0611. Install the permanent password to log in and go to "Manage services". Expand the list of services available for connection, and put the marker in the line "three services Package". Click on the "Connect". On the next page, confirm the connection by clicking on the appropriate button. Personally visit the customer care office of Beeline. Please bring your passport. Ask the office staff to connect you "Package of the three services."